We are so excited to announce a continued partnership with 1st Day School Supplies! St. Andrew’s has collaborated with 1st Day School Supplies to help parents and teachers get the exact supplies needed for the next school year without the hassle and aggravation of shopping at Wal‐Mart, Target, or Staples. We have found 1st Day School Supplies to be convenient, easy and hassle free! Plus, the prices are competitive! You can get started and make your purchase right now by clicking the link above. Registration for our Spring After School Programs is now open! Classes begin Monday April 30 through Friday May 25. 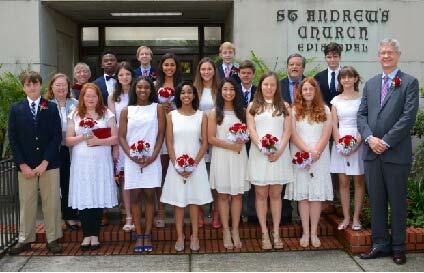 Click the links below for registration procedures, class offerings, and the registration form. Registration runs from Friday April 20 through Friday April 27. Join us for some fun after school! Every January we begin planning for the next school year. We want to make sure that it doesn’t come as a surprise to our new school families and all of our cottage families. On Tuesday, January 23, 2018 re-enrollment contracts will be mailed. Families will have until Friday, February 2, 2018 to return the signed contract along with a non-refundable deposit. Re-enrollment is very important in planning for the following school year. Please return the re-enrollment contracts and deposits on a timely basis so we can begin offering spots to new families who have applied for the 2018-19 school year. Have you checked our Facebook Page lately? Our social media presence is increasing and thanks to our faculty, we have daily photos posted of students at work. It’s an easy way to get daily information of what’s going on around campus, see videos, photos, and more! 1) Go to our Facebook Page and “LIKE” US! Thank you for helping spread the word about our wonderful school! 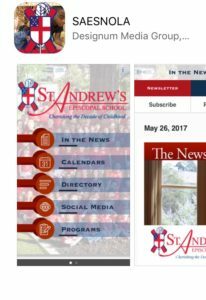 Download our mobile app to stay informed and keep abreast of St. Andrew’s News & Events! Some information is locked to protect the privacy of our parents, administration, faculty and staff. 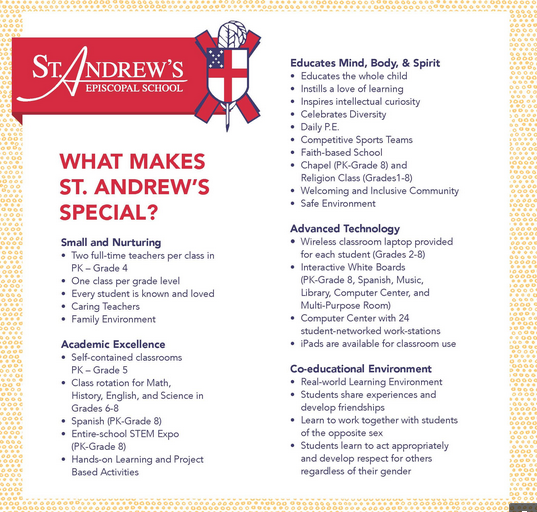 If you need the passcode or assistance in downloading the app, please contact Lisa Witter, Director of Advancement, Enrollment and Financial Aid by phone 504-866-6553 or email to lwitter@standrewsepiscopalschool.org. Register Now for Fall After School Programs! From music and dance to theatre and art, there’s a creative class for everyone! For information on registration procedures, class offerings, and the registration form visit our After School Programs page. Classes begin on Monday October 2nd.